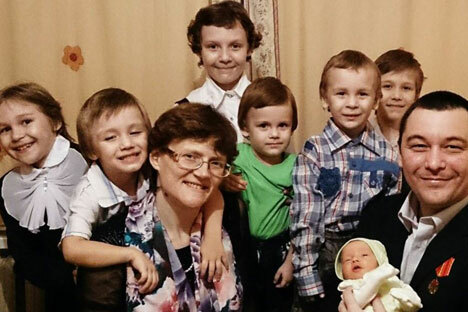 A mother of seven has been accused of betraying Russia to Ukraine and charged with high treason after allegedly passing information on the whereabouts of Russian soldiers to the Ukrainian Embassy. Svetlana Davydova, an inhabitant of the Smolensk Region (200 miles west of Moscow), is accused of telephoning the embassy in April, 2014 to report that the military base next to her house had been vacated and that its soldiers could have been sent to Donetsk in eastern Ukraine, where a war is being fought between Ukrainian government forces and a rebel army allegedly being provided with military support from Moscow. Davydova is currently being held in Moscow’s Lefortovo pre-trial detention center. On Jan. 21, 2015, men dressed in black camouflage burst into Davydova’s apartment and a man identifying himself as a colonel from the investigative department of the FSB (Russia’s security service) declared that Davydova was being detained on charges initiated according to Article 275 of the Criminal code of the Russian Federation (high treason). "Svetlana was taken away right there," says Davydova’s husband Anatoly Gorlov. After several hours of investigation, the FSB employees confiscated notebooks, a computer and a laptop from the apartment. A day later Davydova's husband learned that she had been transported under guard to Moscow where the Lefortovsky district court chose to remand her in custody. A court official confirmed to the Interfax news agency that Davydova had been “taken into custody for a term of two months.” According to Gorlov, the court did not take into account that Davydova has seven young children. The lawyer Anna Stavitskaya, who previously defended military expert Igor Sutyagin, convicted of espionage, believes that the charges against Davydova do not correspond to the Criminal Code. Stavitskaya noted that Davydova couldn't have access to state secrets as she isn't on the state service and has no access to special data. "Her reference to a conversation that she heard somewhere cannot be disclosure of a state secret", said Stavitskaya.